What would you do in a given situation? What would your students do? When your class is learning and practicing conditionals in English, it’s a good time to get to know each other better. The following exercises give your students an opportunity to share about themselves, their habits, opinions, and hopes while practicing conditional structures in English. This game will get your students up and moving and thinking about how they would handle possible situations. Every student in class should receive two index cards. They will use these cards to write a complete conditional sentence. On the first card, students should write a condition clause (if-clause). The condition should be a possible future event. It can be about anything at all as long as the person writing it will be able to logically and grammatically complete the sentence. Conditions might read as any of the following: If it rains this afternoon, if I get the wrong food at a restaurant, if I get married this year, etc. On the second card, students should write a statement that completes the sentence, a result clause. Because the condition is in the future, the result clause should be in the simple future. Result clauses might read as follows: I won’t play tennis, I will talk to the manager, my mother will be very happy, etc. Once everyone has both clauses written on separate cards, collect the condition cards in one pile and the result clauses in another. Shuffle them, and deal each student one card from each pile. Students should then mingle around the classroom asking about their classmates’ cards until they find the match to each of their clauses. When two people find a match, they should stand next to each other – the condition card on the right and the result clause on the left. Once all the condition cards are correctly matched with all the result cards, all your students should be standing in a continuous circle. How well do your students know each other? Can they predict what their classmates will do in unusual situations? Find out with this conditional writing activity. Start by assigning an unusual condition to each person in the class. For example, if a person won a million dollars, if a person made an important scientific discovery, if a person was “discovered” by a movie producer, if a person became step parent to twelve children, etc. Using their conditions, each student should predict what the members of his class would do. He should write his condition clause and predictions in complete sentences on separate slips of paper (sticky notes work great). (For example, If Maria won a million dollars, she would give it all to charity.) Then collect all the predictions and separate them into piles for each person in the class. While you are sorting the predictions into piles, give students a copy of all the unusual conditions and ask them to write a complete sentence for each condition about themselves. Once everyone has finished writing predictions about themselves, give each person his pile of sticky notes. Students score one point for each prediction they made that matches his classmate’s actual answer. The student with the most points wins the game. Do your students know what a bucket list is? It’s a list of activities a person wants to do before they die (or kick the bucket). Have your students think about things they might put on their own bucket list as they practice writing second conditionals. Tell your class to imagine they only have one week left to live. How would they spend that time? Have each person write a paragraph using the second conditional structure telling what they would do with the seven days they have remaining. After writing the paragraphs, have each person share her plans in front of the class for two to three minutes. What do you do in typical situations? What do your students do? In this activity, students will guess what the conditions might be based on their classmates’ reactions to them. Each person should start by listing five to ten situations that they typically encounter each week. These situations might be things like if I have a test, if I want to watch a movie, if I forget my phone, etc. Students then write conditional sentences that include the conditions and their typical reactions to them. If I have a test, I study the night before, for example. Once the sentences are complete, have students work with a partner. The two will take turns reading one result clause but not the condition clause. The other person then has to guess what the condition is that predicated that result. For example, an exchange between two students might sound like this. A: I call my mother. B: Do you call your mother if you get homesick? B: Do you call your mother if you need money? A: Yes, if I need money I call my mother. Students take turns guessing at their partner’s conditions until they have both finished their lists. Everyone suffers some disappointments in life. Likewise, we all make mistakes. Give your students a chance to think about the things in their past that they wish they could change. Have each person write a statement about something in their past they wish was different. They should write one sentence that says what actually happened and then a conditional statement (using the third conditional structure) that says what the person wishes had happened. For example, a student might write, “I never went to summer camp. If I had gone to summer camp, I would have made more friends.” Collect everyone’s statements and then read them to the class one at a time. The rest of the class should guess whose past they are hearing about in each conditional statement. International students naturally grow close to each other as they study overseas. You can give your students a chance to deepen their understanding of one another with these conditional activities that allow them to share about themselves. If you do, your class will be more understanding of and sympathetic toward each other, and they will gain experience with the conditional tense as well. Do you do special activities in class that help your students get to know each other throughout the year? What are your favorites? 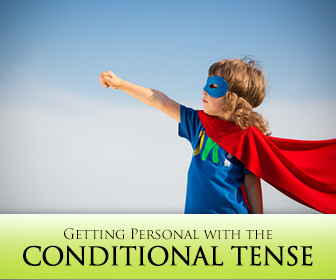 Are Your Students Suffering From Conditional Confusion?